Asmodee Digital, the digital branch of the board game publishing giant Asmodee, has announced that Carcassonne will be tile-placing its way to Nintendo Switch. Bringing board games into the digital realm is nothing new, but the Switch has yet to see many releases of the digital board game variety. (Well, Monopoly is on the system and it is far from a stellar port, but it exists nonetheless.) 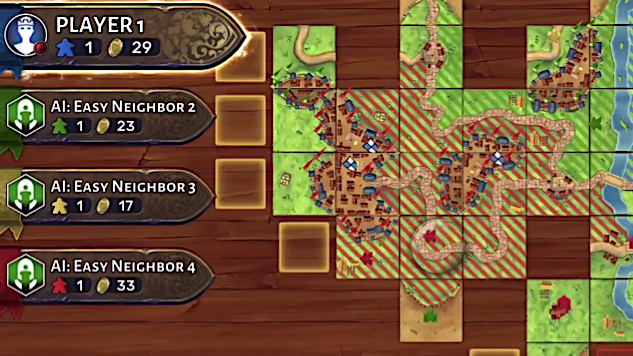 Carcassonne being available on the Switch will be great for those who want to get their board game fix in short bursts, on the go. Carcassonne is a tile-placing board game where players are tasked with drawing and placing tiles that resemble chunks of medieval France—a city, road, grassland or the like. Tile placement is key in that tiles must be placed adjacent to ones that have already been previously placed and, having placed a tile, the player can decide whether to place a meeple on their now-connected tile—a bandit on the road, a knight in a field and so on—and once an area is completed, the meeple(s) will earn points for the player. It is a deceptively simple game that players of almost any age can play and it acts as a great intro to more complex board games. Plus, it is just plain fun, and it exerts a warm, relaxed vibe that conjures images of playing it next to a fireplace on a cold, snowy night in the throes of winter. But now it will be able to be played on the bus, on a plane, on a train … or maybe even in space. Along with Carcassonne, Asmodee Digital hopes to bring more of their board games to the Nintendo handheld hybrid—CEO Pierre Ortolan called Carcassonne “the first Asmodee Digital title of many to follow on Nintendo’s platforms” in a statement Tuesday. This is big news for Switch owners and board game fans alike, as Asmodee Digital has crafted digital versions of Scythe, Terraforming Mars and Ticket to Ride. Scythe is probably the most complex and time-consuming of the bunch, but having it on the Switch would make for a great avenue for players to learn it. Also, being able to play Ticket to Ride with friends in handheld or docked mode sounds like a genuine blast. Carcassonne will be released on the Nintendo Switch later this year, this winter specifically, and hopefully more Asmodee titles follow suit. Check out the trailer below for a glimpse as to how the digital version of the game will look on the Nintendo Switch.